And 30-day Money Back Guarantee! 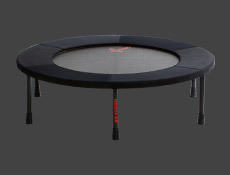 High-intensity use of your rebounder may result in the need for eventual replacement of such components as springs or mat. This “reasonable wear” is not considered a defect in workmanship or materials, however, in such cases that anything goes wrong, we are happy to replace up to a limited amount: 1 frame, 36 pins, 6 legs, 6 leg springs, 2 hinges, 1 mat, and 36 springs. Purchaser is responsible to cover all shipping costs of warranty claim replacements. On all shipments outside the U.S. the purchaser and/or recipient is responsible for any and all taxes, duties, customs, fees, etc. This warranty is effective for units sold after September 25th, 2002. (Commercial uses excluded — click here for club and commercial use warranty): AIR Inc. reserves the right to either repair or replace the exercise device. We may require proof that warranty claim needs replacement to verify the validity of the claim. This warranty is valid as long as the user’s weight is not in excess of 300 pounds (400 pounds for the Ultimate Quarter-Fold) and providing the unit is used in its intended manner. Also, this warranty is valid for the original purchaser only. AIR Inc. will not recognize any and all other guarantees or warranties, expressed, implied, written or otherwise stated. Although every attempt is made to embody the highest degree of protection in all equipment, we cannot guarantee freedom from injury. The user assumes all risk of injury resulting from use. All merchandise is sold based upon this condition. 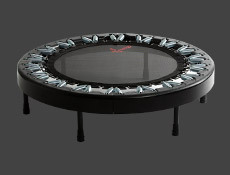 30-day money-back guarantee and restocking fee: If you are not completely satisfied, you may return your ReboundAIR™ within the first thirty days. All returns will be charged a 15% restocking fee as we will not be able to sell the return as new. These will be checked and sold as “refurbished”. There are no returns after thirty days. Company Shipping & Handling Policies: We benefit from the timely talents of UPS to fulfill the delivery requests. Our products are picked up once every business day. Expect to recieve your order within 3 to 5 business days, lower 48 states only. FREE Shipping, when offered, does NOT include international orders, Hawaii or Alaska destinations. Please call for a quote. Privacy Policies: We will not sell your personal information. We will use your personal contact and billing information to communicate order status. At times, we may send an e-mail with industry news, health newsletter and notices of discounts offered to you as our previous customer. We will gladly remove your address from our e-mail list, if you so desire. Your shipping address is maintained in our accounting department for warranty claim purposes only. Please call with warranty questions, claims or to change your address, so we can better service your warranty and replacements. We hope you enjoy your new equipment as much as we do. 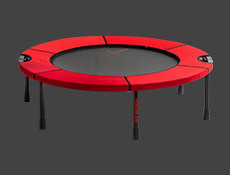 If you are pleased with your new ReboundAIR™, share your discovery with your family and friends. If you are ever displeased with our products or services, please inform us and we will work to remedy the concern immediately. “Rebound to better health!” -Al Carter and the Research and Development team, AIR, Inc.
Feel free to call toll free 1-888-464-JUMP (5867) or e-mail us your thoughts!